I appreciate your patience, your ability to teach. Although I am a beginner and do not speak much English, your adaptability with players of all levels has helped me to feel very much at ease. I am very happy with this experience. To me, Sara has become more than just a golf instructor, she is my great friend. 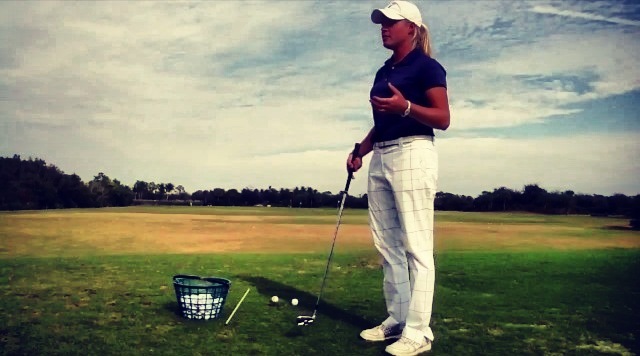 While she is extremely educated in all areas of the game, her methods of teaching are simple and easy to understand. Lessons are specific to my game, instead of one size fits all. More than this, she brings out the joy of the game and the constant pursuit to which we as golfers have dedicated our lives. The best thing about Sara is that she genuinely wants me to improve, and is always there to support me on my journey to be not only a better golfer, but a better person. In 23 years of launching and operating one of the midwest’s most prominent golf academy’s, I have had the responsibility to work with and train dozens of aspiring young golf professionals. Golf world, take notice: Sara Dickson is one to watch! She has and is cultivating so many vital teaching talents and skills – and leading her way is a caring, passionate empathy that is, in my opinion, the foundational core of a truly great teacher/coach. Go see Sara! I have been taking lessons on a weekly basis from Sara since January. Sara’s approach to teaching me has been to listen, analyze what I am saying, interpret the cause and effect, and then helps me settle in on what any problem is. She amazes me with how quickly she interprets, and then tells me exactly what I am doing wrong. It may be weight distribution, alignment, not turning hips and upper body, follow-through, grip, etc. Because Sara is left-handed, she stands opposite me to demonstrate the technical and visual requirements and this becomes two plus two equals five. Sara is always supportive, encouraging, and has a soft, pleasant and bubbly personality. She always has a smile. She is always interested in my progress. She never misses asking how my game was, is always as excited as I am when I have a particularly good game, listens when I have a bad one, and helps me zero in where I need improvement whether it is with driving, fairway or short game. It is so gratifying when on the course playing with seasoned golfers, female or male, you feel, “YES, I can do this, I can play this game!” Sometimes I even say it out loud! Thank you Sara for your wonderful ability to teach golf, your open ear, your words of encouragement, helping me learn my way, and feel comfortable with a game that I never thought I could. I find Sara’s teaching to be insightful, positive, and pedagogically accurate. Having been a scratch golfer 25 years ago, I appreciated her ability to connect my existing knowledge with new ideas regarding technique and equipment. Above all, she practices what she preaches; she can easily demonstrate the ideas that are verbally conveyed. Many students learn by watching- and Sara is an excellent model for textbook technique. Thank you so much, Joe. I am very grateful for the opportunities you have provided that allow me to continue learning. Thank you for taking the time and effort to do so, it does not go unnoticed.